Kana Cards with Japanese Syllable Kana to Print and Practice! You can easily learn and repeat the Japanese syllable script named Katagana and Hiragana with these small Kana cards. Simply print out on strong paper, cut out and that's it! You need the Abobe Acrobat Reader to show and print. Use strong paper (>150g/m²). It has a better grip und the card back does not shine through. First print Hiragana Sheet A, then turn the printed sheet and print backside Hiragana Sheet A on same paper. Although you pay attention to all points, there is no guarantee for correctness and completeness. 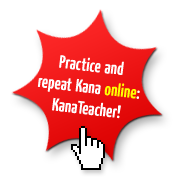 Practise Kana online with KanaTeacher.